The Q-Connect Q8MICRO Micro-Cut Shredder is a high-security machine capable of shredding up to 8 sheets of 75gsm paper at a time. In addition it will also shred credit cards, as well as small staples and paperclips - so you don’t have to spend your time removing these prior to shredding. The shredder shreds paper into particles measuring just 3.3mm x 9mm, giving it a P-5 security rating, suitable for secret and highly confidential document shredding. This means that each A4 sheet is shredded into approximately 2117 pieces! 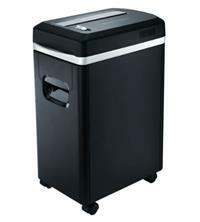 Bin capacity is 15 litres, and the shredder has a pull out waste bin for easy emptying. Duty cycle is 5 minutes of continuous shredding, after which a 20 minute cool down period is required - and recommended daily usage is up to 50 sheets per day, great for home or small office use. Other features include: Auto start and stop; a reverse function; a 220mm (A4 size) width opening; safety cut out if the waste bin is not fully closed or if the shredder head is not fitted correctly; overheat protection; handy LED indicators to show that the shredder is in standby or the bin is full; castors for increased portability; and a Shredsafe safety cover feature to help prevent fingers and objects being accidentally put into the shredder.